Have you ever resolved to read through the entire Bible, only to abandon your resolution when you reached the long, detailed passages of Leviticus? Or wondered why God included all those lists of ceremonial laws and instructions in His inspired Word? What can those dictates possibly mean to Christians today? Schultz's clear, step-by-step study of this Old Testament book will convince you that, among those complicated instructions to the people of Israel, God does have a message for you. Take a closer look at those rituals and rules. The study of Leviticus can give you a deeper, richer understanding of the holiness of God and His desire and provision for fellowship with His people. Nothing could be more relevant to your life. 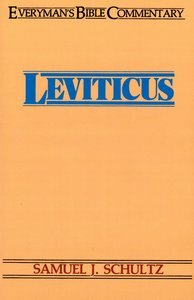 About "Leviticus (Everyman's Bible Commentary Series)"
Samuel J. Schultz is an emeritus professor of Bible and theology at Wheaton College. He is the author of "The Prophets Speak: The Law of Love -- The Essence of Israel's Religion, Deuteronomy: The Gospel of Love, The Gospel of Moses, Leviticus, " and numerous articles on biblical subjects. Order now to secure your copy when our stock arrives. eBook is Available. 0 Available. Expected to ship in 4 to 5 weeks from Australia. This concise interpretation of the apostle Paul's first letter to Timothy keeps technical matters to a minuimum, while making every effort to provide a clear explanation of each portion of the epistle. Dr. Hiebert's verse-by-verse method keeps the trend of thought before the reader by means of a well-developed outline. The letter to Timothy was intended to give him needed help in opposing the false teachings that were creeping into the church. Hiebert's valuable commentary makes the truths Paul taught Timothy clear and easily applicable to the layman and busy pastor. D. EDMOND HIEBERT (B.S., John Fletcher College; Th.M., Th.D., Southern Baptist Theological Seminary) served on the faculties of Tabor College and Mennonite Brethren Seminary, Fresno, California. Dr. Hiebert is the author of The Epistle of James, Introduction to the New Testament, Volumes I, II, and III; and The Thessalonian Epistles. J. CARL LANEY (B.S., University of Oregon; M.Div., Th.M., Western Conservative Baptist Seminary; Th.D., Dallas Theological Seminary) is professor of biblical literature at Western Conservative Baptist Seminary, Portland, Oregon. He is the author of commentaries on First and Second Samuel, Ezra and Nehemiah, and Zechariah for the Everyman's Bible Commentary series. Dr. Laney has also written several other books, including God (Understanding Christian Theology Series), Tyndale Concise Bible Commentary, The Divorce Myth and Baker's Concise Bible Atlas. He resides in Portland, Oregon. The books of Samuel focus on the lives of three men: Samuel, Saul, and David. They are first seen as individuals rising in their respective careers. As time passes, their lives more frequently interact and become interwined with each other. J. Carl Laney covers these two books section by section, often pausing to clear up a difficult passage that would mean trouble to the reader. This volume is complete with many maps that prove to be an invaluable aid to the reader in helping him to plot out where the action of a particular chapter is taking place. Dr. Laney helps the reader to understand the anguish and agony David experienced as a result of the division of his household and the rebellion of his son Absalom. We can see how Saul met his ultimate downfall as king because of his reliance upon outside sources for guidance instead of implicitly trusting in the Lord. One also sees the godly Samuel who, nevertheless, was unable to keep his own household in order. Contemporary lessons are plentiful in these two Bible books and available to those who take the time to study their truths. A reliable guide to Paul's last letter is provided by D. Edmond Hiebert in this concise interpretation of 2 Timothy. The verse-by-verse exposition offers a systematic explanation of the entire book. A comprehensive outline accurately follows the progression of Paul's thought, giving a quick overall view of the contents. Second Timothy is the most personal of the Pastoral Epistles. It was written shortly before Paul's martyrdom and contains intimate words of lasting significance. The apostle's special concern for both Timothy and the people he served is laid bare in this touching letter of instruction and encouragement. Second Timothy is characterized by clear expression and a penetrating analysis of this epistle written to a son in the faith. The outline is designed as a chart and guide to the meaning of the epistle and is interspersed in the interpretative text. Technical matters have been kept to a minimum but discussion of the Greek is included where such commentary is needed.